The aim of the present work was to determine the efficacy of flubendazole (FLBZ) against Echinococcus granulosus metacestodes by using in vitro and in vivo models. Groups of 50 microcysts developed in vitro, and groups of 10 peritoneal cysts were obtained from Balb C mice with experimental secondary infections of 8 months. The cysts were placed in Leighton tubes containing 10 ml of culture medium. FLBZ was added to the medium resulting in final concentrations of 5 and 1 μg/ml for mycrocysts treatment and 10, 5, and 1 μg/ml for murine cysts treatment. In vivo treatment was performed on 20 mice that developed an experimental secondary hydatid disease over a period of 11 months. FLBZ was given (1.5 mg/kg) by the oral route once a day for 50 days. A loss of turgidity was detected in all in vitro drug treated cysts irrespective of the drug concentration or parasite origin. Inspection of treated cysts by scanning electron microscopy (SEM) revealed that the germinal layer lost it characteristic multicelular structure. These results were confirmed on the ultrastructural level by transmission electron microscopy (TEM), treated metacestodes had undergone considerable degenerative changes after the in vitro treatment. The results obtained after the in vivo treatment with FLBZ showed no significant difference between the control and treated groups related to the weight of cyst masses. However, the ultrastructural study at TEM of cysts that developed in mice from the treated group revealed alterations in the germinal layer with the presence of numerous vacuoles. With regard to the ultrastructural study at SEM, only cellular debris of the germinal layer could be seen. In conclusion, the data obtained clearly demonstrate that in vitro and in vivo treatment with FLBZ is effective against E. granulosus metacestodes. 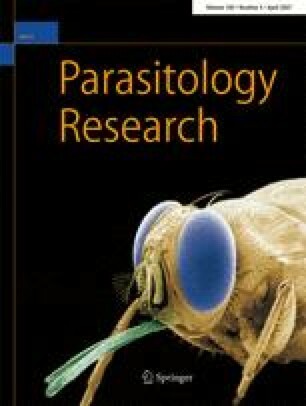 The authors acknowledge Dr. Leo Van Leemput (Janssen Animal Health) and Dr. Gustavo Viana (Janssen, Buenos Aires, Argentina) for providing FLBZ used in the present experimental work and Dr. Kathleen Vlaminck (Janssen Animal Health) for her critical review of this manuscript. The help of Dr. Gonzalez, Dr. Tessi, Sr. Chasma, and Sr. Pérez is gratefully appreciated. This work was supported by the PICT 02 N° 01-12535, BID 1201/OC-AR, and PIP N° 02172 (Consejo Nacional de Investigaciones Científicas y Técnicas [CONICET] Argentina). Partial financial support of this work was provided by Fundación Alberto J. Roemmers, Argentina.